20 Day Everest Base Camp + Island Peak | Ultimate Expeditions | The Best Adventures on Earth. The Everest Base Camp and Island Peak trek is an incredible Himalayan expedition with a summit of a 20,293 ft / 6,187 meter peak. 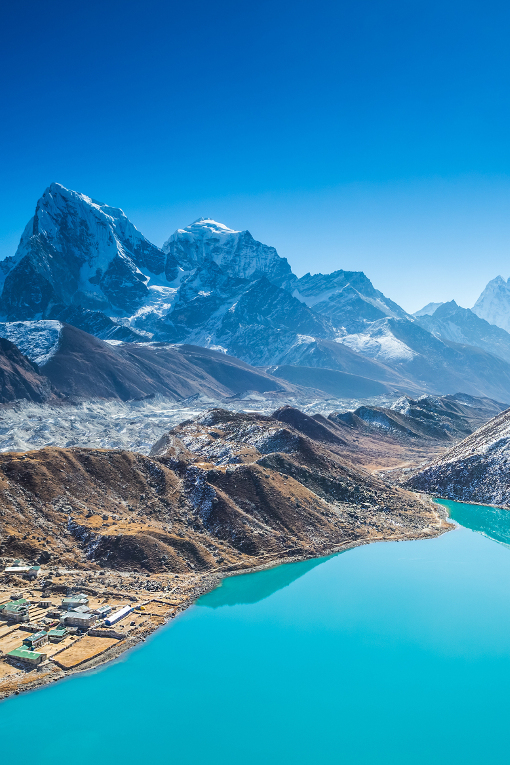 Explore Everest Base Camp, Kala Pattar and Island Peak that towers over twenty thousand feet above sea level on this legendary trek, offering adventure and unmatched beauty. 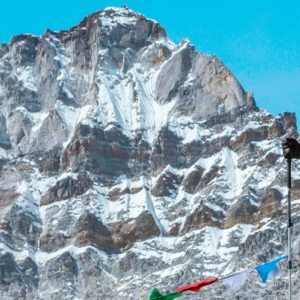 The key to any successful trek in the Everest region is ample time to acclimatize safely and our itinerary has been carefully designed to allow just that. The Everest Base Camp plus Island Peak Trek is a strenuous difficult route, therefore it is required that all participants are in excellent physical condition. 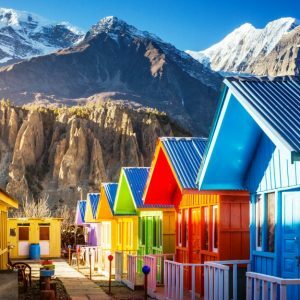 The trip begins and ends in colorful Kathmandu, Nepal. 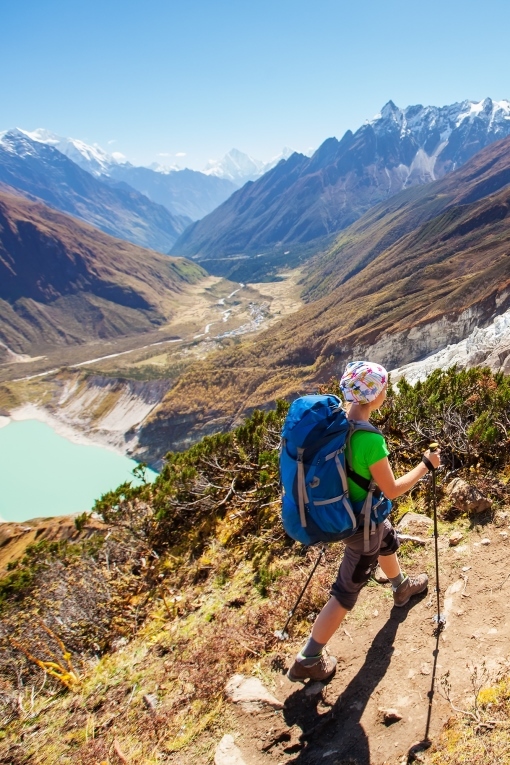 We trade the chaotic streets of Kathmandu for the rock-lined trails of the Khumbu. After an exciting flight to/from Lukla we ascend to the vast glaciers of the Everest Himalayas. Accommodations along the way are in teahouses and tents, meals are “a la carte,” allowing you flexibility to eat what you want. Island Peak is a popular first climb by many trekkers due to the sheer beauty, landscape and scenery. Whereas this ascent does require technical mountaineering skills, a cross mix of rock and ice wall climbing, experience is not required. 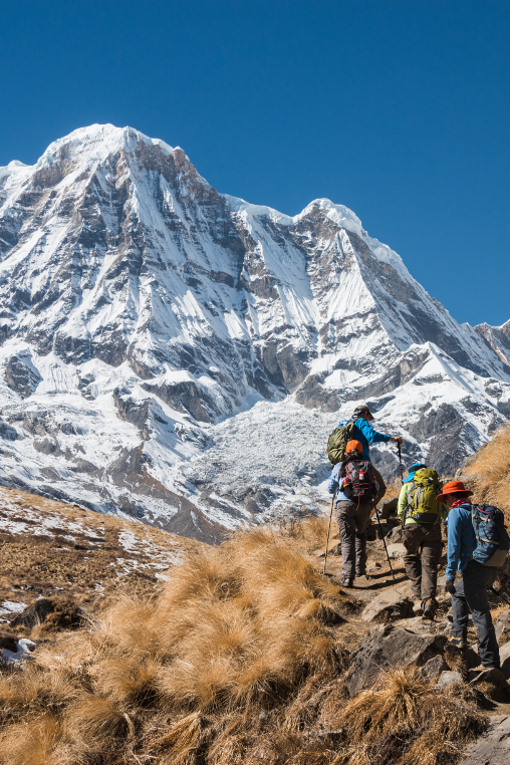 Our guides are trained and licensed by the Nepal Mountaineering Association to ensure you have a safe and enjoyable trek. 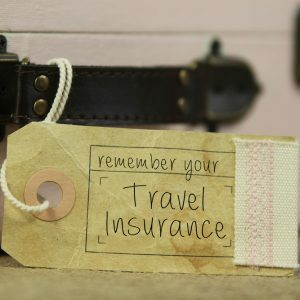 Our friendly Ultimate Expeditions representative will meet you at the airport and drive you to your hotel in Kathmandu. During this meet and greet your guide will discuss the daily activities of your trip. 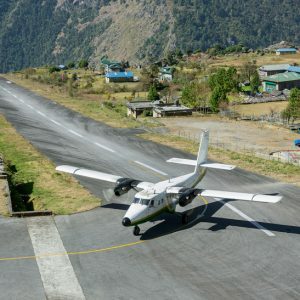 The heart pumping flight from Kathmandu to Lukla is roughly 45 minutes and offers amazing views of the Everest region (from the left side of the aircraft). After landing on a mountainside runway you will meet the expedition crew and once the gear is sorted into loads the trek begins. The trail gradually descends on a well-marked trail to Phakding, approximately 4 hours of hiking. We enter the National Park at Monjo as we continue to our next stop, Namche Bazaar the main trading village in the Khumbu region. The trail crisscrosses the Dudh Kosi (Milk River), these exciting crossing are over suspension bridges that sway high above the valley. The days trek is roughly 4.5 to 6 hours long and once in Namche Bazaar we are free to enjoy a coffee, brownie, chocolate doughnut or some other delightful baked goodie. It is important to acclimatize our bodies as we push higher into the Everest region. The day will be spent in Namche Bazaar, which offers shopping opportunities as well as several lodges. The trail hugs the side of the valley and climbs steeply through a rhododendron forest and crosses yak Kharkas, (summer settlements) until reaching Phorste. 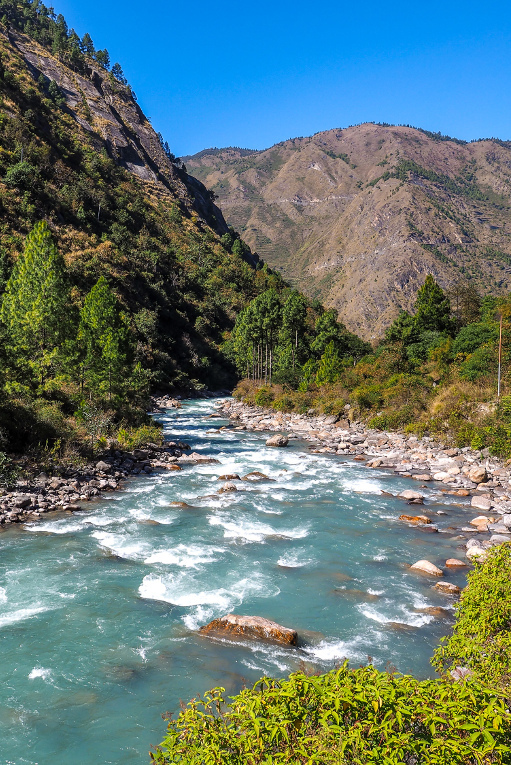 Today the trail descends through a forest that crosses the Imja Khola River and then climbs steadily to the village of Pangboche. Ama Dablam, 22,493 ft (6,856 m) comes into focus, rising high, offering incredible views. Another acclimatization day is required as we gain elevation. From Pheriche, Towache Peak towers above the small village with Cho Oyu and Lobuche Peak in the distance near the Tibet border. Choose to hike up the Imja Khola valley which offers a peek at Ama Dablam’s north face. 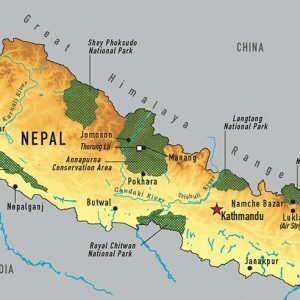 Alternatively, you can hike the ridge that overlooks Dingboche for more spectacular views of the region. As we trek closer to the Khumbu glacier the air becomes thinner and movements slower. Today the trail crosses the terminal moraine, passing several (Chortens) monuments which have been constructed for Sherpas and Everest climbers lost in expeditions over the years. The path climbs along the glacier to Lobuche. Today’s trek starts by following the broad valley which runs parallel to the Khumbu Glacier and a stop for lunch in Gorak Shep before reaching Everest Base Camp at 17,575 ft (5,364 m). This trek is roughly 3 hours’ time and navigates through ice pinnacles and crevasses. On the return, a higher route can be taken for spectacular views of the notorious Everest Ice Fall that flows from the Western Cwm. A demanding hike to the top of Kala Pattar 18,221 ft (5,554 m) will begin early. The views from Kala Pattar are breathtaking; here you can gaze upon Everest and deep into the Khumbu ice field. 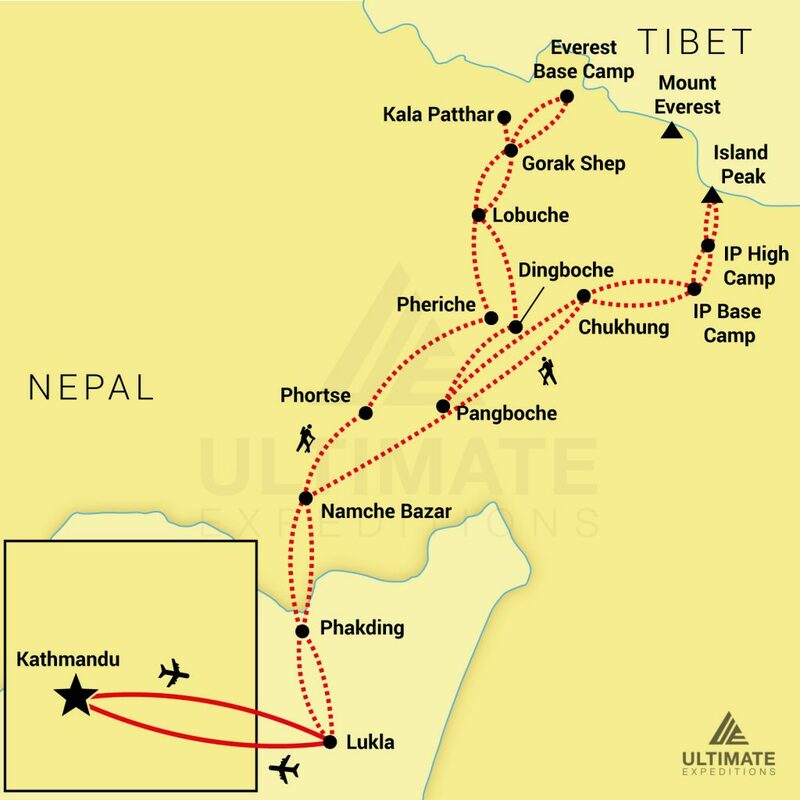 We will then descend to Dingboche. Today’s trek climbs gradually to the small settlement of Chukhung. Along the way you can take in the beautiful views of Island Peak and the pending challenge that awaits you. 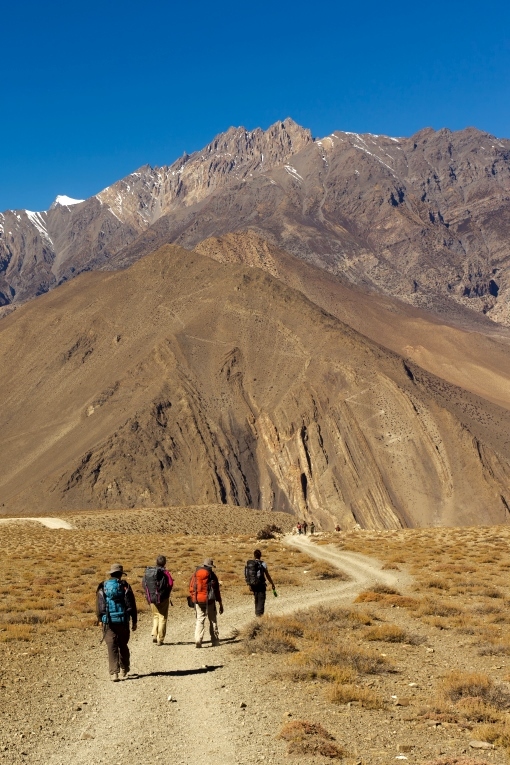 Heading towards Island Peak Base Camp, we trek deeper into the Imja Valley. Today will be a short day on the trail. As we reach higher elevations our trekking time becomes shorter, allowing our bodies to rest which helps with acclimatization. Today we climb approximately 656 ft (200 m) to reach High Camp. Here we will relax and make final preparations for the ascent of Island Peak in the morning. Today starts very early in order to summit. 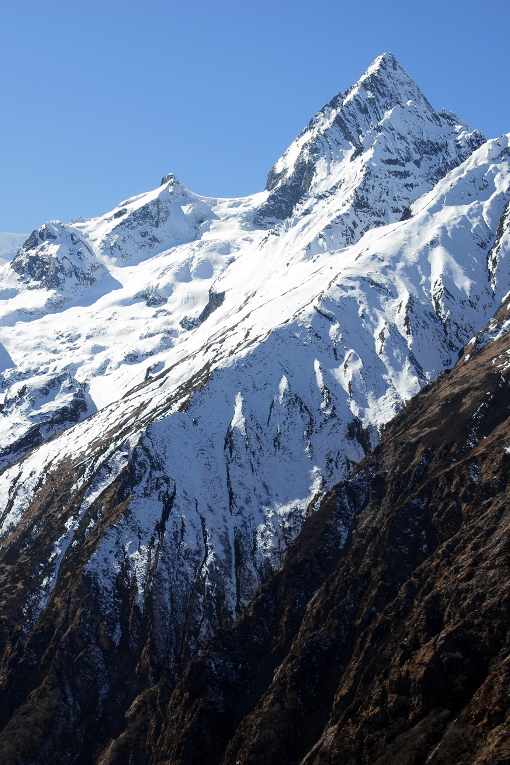 The crossing of the Imja glacier is a fascinating experience, here you will harness, rope-up and put on your crampons. The glacier is followed by a steep snow slope that leads onto the summit ridge. Upon reaching the summit of Island Peak you will have a stunning view of Lhotse’s south face and abundant dramatic mountain scenery in every direction. To get back to base camp you will descend along the same route. A contingency day allocated for weather. The trail descends to Chukhung and Dingboche where it joins the main Everest trail and we continue on to the village of Pangboche. From Dingboche we follow along the river to Tengboche before making our way back to Namche Bizarre. 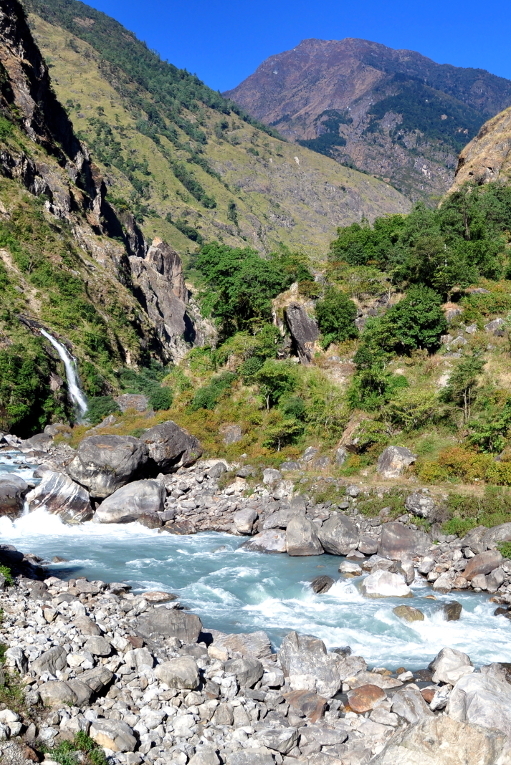 This is our last day of trekking and the trail follows the Dudh Koshi River from Namche Bizarre back to Lukla. This is a great time to reflect on your experience and celebrate a great accomplishment. 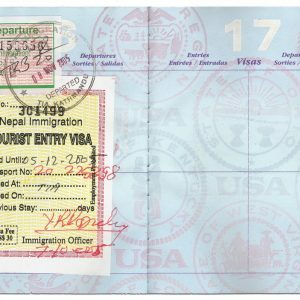 After an early breakfast, you will catch a return flight to Kathmandu and stay overnight. You will have free time to roam the streets of Thamel, shop and enjoy the rich culture. Our Ultimate Expeditions representative will drive you to the airport in Kathmandu for your return flight home or perhaps to your next destination.